Check your headlights and find out what bulbs your car takes. Thereâ€™s no excuse not to change them if they are out of order or faded. Halfords and Motorworld stores will change them for you if youâ€™re stuck. Inspect your wipers to see if theyâ€™re cracked, perished or worn. If they are, replace them! Your visibility is crucial in winter driving conditions. Motorworld or Halfords have a fitting service if this looks daunting to you. Make sure you have a quality screenwash in your washer bottle otherwise it will freeze and you wonâ€™t be able to see! 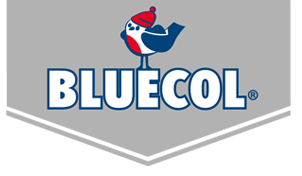 Bluecol 3 in 1 contains a de-icer and a rain repellent too so youâ€™re fully protected! Available in a trigger or aerosol, simply spray on to clear your windscreens from deep frost. Remove any excess snow for your de-icer to work quickly and effectively. A new innovation which was originally developed for use in Alpine conditions, simply spray Snow Grip onto the vehicle drive tyres to provide up to three times better traction on snow and ice. Gets you un-stuck and moving again. A pair of textile snow socks slipped over the driven wheels will provide dramatically more grip than even the best winter tyres can. They are very easy to use and are available in 5 sizes. Avoid being stranded without a pair of Jump Leads. Battery failure is one of the commonest reasons for calling a breakdown service. If you have jump leads then you just need a car with a battery in good condition so you can start from it! In case you breakdown and need to be towed home, be prepared with a quality Tow Rope. A long one is better as it means safer towing. Check what maximum weight load the tow rope can take too. You are more likely to have an accident or breakdown in winter so in times of an emergency, your phone will be crucial. Ensure you always have charge and keep an in-car charger with you so you can stay in touch.